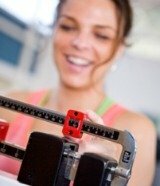 We've put together a few Atkins diet examples to get you started toward your weight loss goals. The Atkins diet focuses on eating plenty of lean protein, certain vegetables, plenty of salad greens and healthy fats, but many people are unsure how these ingredients translate into daily life. Since it's such a departure from more traditional diets, Atkins can throw some people. People tend to want to "eat light" or even forego breakfast when dieting, afraid they will eat too many calories early in the day. On the Atkins diet, it's essential to eat a healthy, full breakfast. This not only jump starts your metabolism, it also lays the foundation for the rest of your day. During the Induction phase of the diet, a typical breakfast might be scrambled eggs with spinach, two strips of bacon, and some coffee. You can't eat toast, biscuits or muffins while on Induction. During ongoing weight loss (OWL), you can get a bit more creative and add some limited carbs and dairy products. An OWL breakfast might be sausage, eggs benedict, and low carb toast. When you move on to maintenance, you can eat any of the breakfasts you've already tried, but add melon, citrus fruits or berries. Keep in mind that fiber is essential at every phase, so a whole orange is much better than just orange juice. During Phase 1, you should eat some lean meat (chicken, fish, lean beef, etc.) with a salad. The salad is important, as you do want to try to get a full three cups of salad greens into your diet every day. Use half for lunch and save the rest for dinner. Once you enter OWL, you can vary your lunch menu more by eating cold cuts such as lean turkey and ham. Simply wrap these around some aged cheese for a delicious meal supplemented by a side salad. During the maintenance phase, you can create your wraps with low-carb tortillas and add some crunch with pork rinds or a few potato chips. Dinner is where you should be eating at least one third of your carbohydrates. Also keep in mind that it's okay to use olive oil, butter, and cream to add variety and texture to your meals during any phase; the Atkins diet allows fats in moderation during every phase of the diet. A nicely grilled lean steak or some roasted lamb is an excellent dinner choice for any phase of the diet. During Induction, stick to a tossed salad as your main side dish, but supplement your meal with some grilled asparagus or buttered broccoli. When you move on to ongoing weight loss (OWL), you can add some low carb foods such as a muffin or roll made with Atkins baking products. These keep the carb count low by giving you a filling, satisfying accent food that tastes like it is much higher in carbs than it really is. During the maintenance phase, you can add real carbs in moderation. Try a flavorful wild rice with veggies such as mushrooms or onion. You can find many other Atkins diet examples on the Internet. If you have trouble putting together meals that fit the plan, visiting Atkins diet websites can give you hundreds of sample menu plans and grocery shopping lists to make it easy to stock your pantry for every phase of weight loss.